Historically, the area now known as Roundshaw Downs was used as farmland, but at the beginning of the 20th century it became home to Beddington Aerodrome, which was established in order to protect London during the First World War. The site and surrounding area, including the adjacent Waddon Aerodrome, became home to National Aircraft Factory No.1 which mass produced aircraft for the war effort. Once the First World War was over, the site was handed over for use in civil aviation before being taken back under RAF control during the Second World War. The aerodrome eventually operated under the name of Croydon Airport. Until the end of the 1950's this was London's main airport (and for a time, Britains only major international airport). It is famous for developing the Air Traffic Control Tower, and the distress phrase 'Mayday, Mayday, Mayday' was conceived here. The lack of expansion opportunities at the airfield eventually lead to Croydon Airport closing down. Over the next 30 years, nature took over and thrived. Then in 1993 the area was formally renamed Roundshaw Downs and declared a Local Nature Reserve the following year. 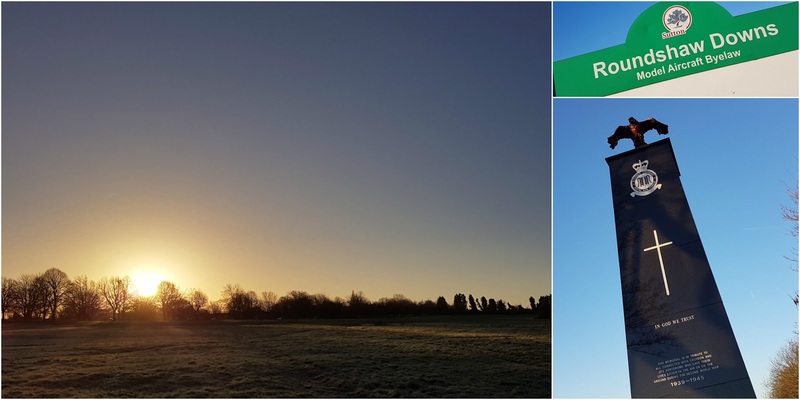 Today, Roundshaw Downs covers 52 hectares area of land located mostly within the London Borough of Sutton, but a strip of the grassland (which is part of the parkrun course) at its eastern border is technically located within the London Borough of Croydon. On 18 July 2009, almost 50 years to the day after the airport closed, the downs became home to Roundshaw Downs parkrun - it is the 15th oldest UK parkrun still in operation. Attendance figures had hovered around the 100 mark for many years, but 2017 saw a noticeable increase and you can now expect to find in excess 150 attendees on a regular basis. This was my third visit to Roundshaw Downs parkrun, however it was the first time I had ever run here on a Saturday. My first two visits were as part of my New Year's Day doubles in 2012 (a Sunday) and 2013 (a Tuesday). After those two visits I didn't write full venue blogs, so coming back gave me the opportunity to give the venue a full blog7t write-up. 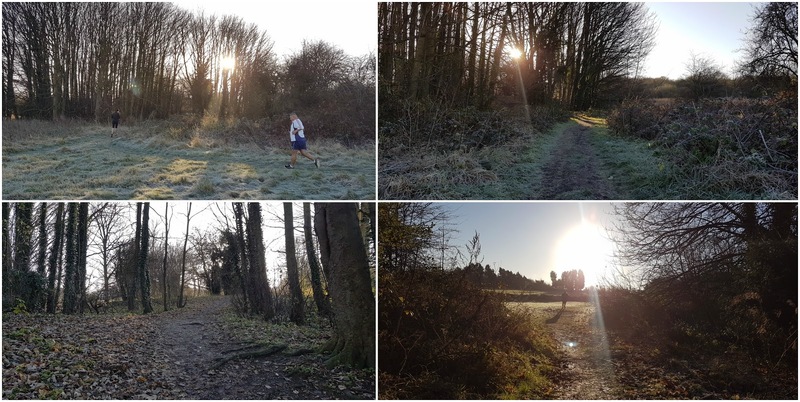 I drove to the venue on a beautiful, but very cold morning in December 2017 - in fact, around 150 parkruns had cancelled due to slippery conditions across the UK, but I was confident that the off-road nature of the course here would keep the risk of cancellation low. Free on-street parking can be found just a few metres away from the start-finish area on Imperial Way - named after Imperial Airways, which was the forerunner of British Airways. Other travel options are possible; if you take the train you will find that Purley Oaks and Sanderstead are the closest stations. Buses run along the main A23 and you can alight at Croydon Airport bus stop. There aren't any formal bicycle parking options on the downs themselves, although there are some bike racks on the opposite side of the A23 within the Purley Way Playing Fields car park. I don't think there are any toilet facilities available here, so you may need to plan an alternative into your pre-run prep. In the vicinity of the downs you will find many large, modern superstores and warehouses. However if you take a closer look you may spot some of the original airport buildings - most notably on the main A23 Purley Way is the former terminal building, Airport House. In front of this is the unmissable sight of an aeroplane raised on struts - it is a de Havilland Heron, which is the type of plane that made the last passenger flight from the airport in 1959. Coincidentally it was almost certainly built at the de Havilland factory in Hatfield whose former land is now home to Ellenbrook Fields parkrun. Anyway... the parkrun meeting point is just inside the border of the downs at the end of Imperial Way. The run takes place over two, identical, anti-clockwise laps, it is 100% off-road, mostly grassy, dirt paths which do become muddy in the winter. As it was so cold during this visit, the ground was frozen and I would have gotten away with wearing road shoes, however at this time of year it is advisable to use a pair of trail shoes. The main briefing and start of the run are just a few metres to the west of the meeting point, and from here the participants head off for a trot around the downs. It's worth keeping an eye out for the Sussex Cattle in one of the large enclosures - the cattle help to maintain the delicate balance of the chalk grassland. By eating the grass, they create space for rare wildflowers to grow and these attract a diverse variety of insects which in turn provide food for other species like the Wasp Spider. The area is also home to other forms of wildlife such as voles, kestrels and skylarks. The general theme of the lap is the first 1.8km is spent ever-so-slowly edging your way uphill. At just over a kilometre in, it feels like the top has been reached and you are rewarded with a fantastic view looking towards the centre of Croydon and beyond. However, the course weaves around and through a small patch of woodland where the elevation continues to rise. Upon exiting the woodland, the grass underfoot was longer and it took a bit of extra effort to get through. There is a berm running north-south through the downs and this is now crossed via an opening - it's a tight turn and narrow and I found it broke my rhythm. After this, at about three quarters of the way around the lap, you finally reach the highest point. Which means the last 700 metres or so is back downhill. It's not quite as simple as it sounds because the downhill stretch is quite bumpy underfoot, so it's not as straight-forward as just letting gravity do all the work. Also, if you look to your left you may spot some of the old airport tarmac. With two laps complete it's a simple case of entering the finish funnel, collecting your finishing position token and having them both scanned by the barcode scanner who'll you'll most likely find back at the original meeting point just a few metres away. Once all the participants have completed the course, the team head off to the local Mcdonalds for the post-run social where everyone is welcome to join them. The official results for event number 453 were processed and online a short while later and 126 people took part. A nice bonus for me was that I ran a new personal best for the course by over a minute. I'd also recorded the run using my Garmin and if you want to see the course in more detail please have a look at my Strava file, here - Roundshaw Downs parkrun 453. Before leaving I headed around the course to take some photos and chatted to some marshals. I also popped over to the main road to have a look at the striking RAF memorial which is dedicated to all the people connected to Croydon and/or the aerodrome that lost their lives during the second world war. Later on that day, I converted the GPS data into a course fly-by video by using the Relive app on my phone. You can view the video for that on youtube, here - Roundshaw Downs parkrun course fly-by video.